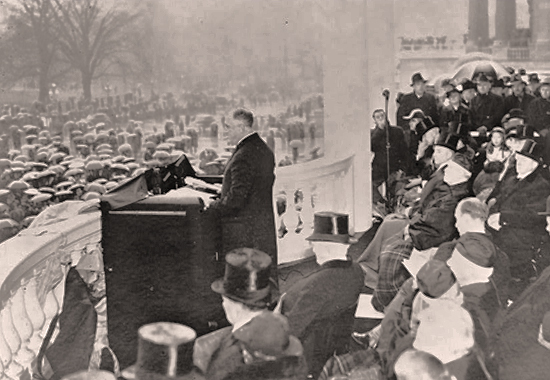 Go here for more about Franklin D. Roosevelt's Second Inaugural Address. It follows the full text transcript of Franklin D. Roosevelt's Second Inaugural Address, delivered on the East Portico, U.S. Capitol, Washington D.C. - January 20, 1937.
the Republic, single-minded in anxiety, stood in spirit here. We dedicated ourselves to the fulfillment of a vision--to speed the time when there would be for all the people that security and peace essential to the pursuit of happiness. We of the Republic pledged ourselves to drive from the temple of our ancient faith those who had profaned it; to end by action, tireless and unafraid, the stagnation and despair of that day. We did those first things first.